The Mourning Doves Coo may sound sad, but bird watchers know that it signals the beginning of this birds habits of nesting, claiming territory, and raising young. It always amazes me where a bird may decide to build a nest and these birds are no exception. As you can see, this one used an old Robin nest on top of the security lights at the back of this house. Two healthy squabs were raised from this nest site. Slimmer than pigeons and about 12 inches in length. Mourning Doves have a soft gray-brown body and a gray patch on the head. Black dots on their wings and a single black spot behind and below the eyes. When perching you'll notice a long tapered tail. In flight you'll see that the tail has a white-edged. Common at bird feeders. 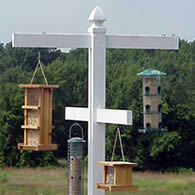 Try placing bird seed on a tray or platform feeder like the one pictured at right. It's important to keep the seed off the ground. White millet, Safflower and cracked corn are the most common seeds they eat. Try offering safflower seed and you'll also get Northern Cardinals eating at your feeders. For more information on seeds and photos of each, please see our Bird Seed Page. These birds prefer open land with scattering of trees and shrubs for cover and nesting. Except for wetland and dense forest, mourning doves can be found most anywhere. They are one of the most widespread and adaptable North American birds. The best garden habitat includes open lawn, herbaceous borders, and flower beds, with scattered patches of trees and shrubs. 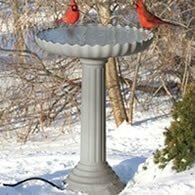 Include a source of water close to the ground (in winter, see: heated bird baths) in addition to providing bird seed and you should be able to attract these birds all year. Beginning as early as March, these birds begin nest building. A loose nest of twigs, grass, weeds and pine needles. I stress loose because their nest can be so lightly put together that often you can see through it from the bottom. 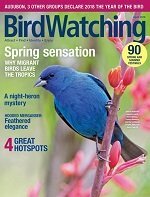 Many folks wonder if they should help the birds out. For the most part I suggest leaving it alone, but I'm not there looking at it like you are. If startled they may fly off the nest too quickly and the eggs could fall from the nest. Birdwatchers would be wise to wait until the eggs have hatched before approaching any nest. Nest abandonment is very common with these birds. If they feel any threat from predators whether human or animal, they may go elsewhere to nest, abandoning both eggs and nestlings. Bird watchers need to exercise caution. The nest can be found 5-25 feet above the ground, often in the crotch of a shrub or tree. Laying 2 white eggs that are incubated for 14-15 days. The young will leave the nest in 12-14 days. They have been known to reuse the same nest for five sets of eggs in a single season. Usually 2 - 3 broods raised each season. The peak of the breeding season is April - July although they may breed as late as October in some areas. You can try attracting them to nest near you by placing a Nesting Shelf attached to a tree or your house. Another trick I've tried was to use a hanging plant container. I fill the container with soil and top it off with some White Pine needles. White Pines have very soft needles unlike many other pines. I place the hanging container under a porch or the roof of my garden gate. If placing on your deck or porch, make sure you hang it close to the outside of the deck or porch. These birds, along with Pigeons, produce a food called pigeon milk (not really milk) by glands in the crop of the adult bird. The parent opens its mouth wide, permitting the nestling to stick its head inside to feed on the nutritious food. In the wild, the adult birds feed primarily on field waste grain. These include corn, wheat, grass, and weed seeds. 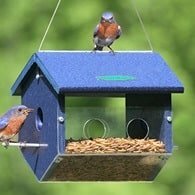 You can attract these birds to your feeder by supplying white and red proso millet, oil-type sunflower seeds, and cracked corn. Often emails from bird watchers arrive asking "Our dove has not left the nest in days, will she starve or die of thirst? What should we do?" Actually, the male does a daytime shift and the female does the night shift. 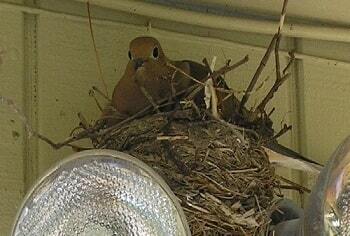 If you are not around during the change, it appears the same bird has been on the nest the whole time. Not to worry, the switch was made while you were not looking. People often worry about when one of the birds die. These birds are perfect prey for cats because they feed mostly on the ground. Sometimes the surviving bird will attempt to incubate the eggs, or continue feeding the nestlings. This is a difficult task for a single bird and often unsuccessful. In due course, the surviving mate will find a new mate. Since they nest several times a season it's possible they will raise a successful brood in the same season. While it's sad to lose these birds in your yard, be comforted knowing they will mate again. The average lifespan of first year birds is 1 - 1.5 years. 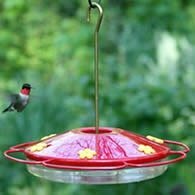 First year birds have a mortality rate of 60 - 75 percent and adults have a mortality rate of 50 - 60 percent. For any songbird the first year of survival is the most difficult. If these birds survive their first year they can live on average 4 - 5 years. Predators include: hawks, snakes, squirrels, cats and hunters. I get many emails complaining that doves have nested too close to the door or where dogs are contained. They ask "can I move the doves nest?" I'm sorry to say that when nest are moved, most times it interpreted as a predator attack and the nest is then abandoned. All I can suggest is to do your best. Use the door if you have to and keep dogs monitored at fledging time. There are times nest must be removed. This happens when nest are located on movable objects such as automobiles or tractors that have sat for a period of time. It's then that I would recommend trying to move the nest but keeping it as close as possible to where the nest was found. Don't walk the nest 20 feet away and place it in a tree. Use common sense. It may not work out, but you've done what you can. I am aware of others who have had success. --- That's my 2 cents on this matter. Please don't write and tell me about the Migratory Bird Treaty Act. I'm aware of what it says and am confident in it's intent. Thank you. 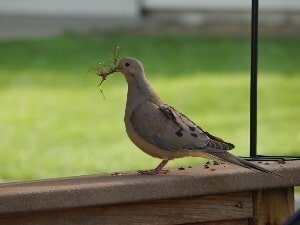 Do you have a great story and photo about Mourning Doves nesting in your backyard? Why Not Share it! Our Visitors will love reading your story and viewing your photos. It's Easy. Just fill in the blanks below and upload your photos. Ready - Let's Get Started! We require at least 300 - 500 Words In Addition to 1 - 4 photos to get Published. You must upload your photos with your story as we do not have the ability to add photos later. To get started: Click the button and find it on your computer. Then select it. Keep pictures to 400 x 500 - If you're having trouble uploading try resizing your photo or use the contact form to reach us. You can upload a total of 4 pictures. Albino mourning dove has moved in! I have Doves in a hanging planter too! My doves in hanging fake plant! It's Just A Rotten Egg! Doves On My Deck - Again! Morning Doves Nesting In My Hanging Plants.